Friends came by for dinner Friday giving me an excuse to spend some extra time on the meal. Craving Indian food, I made a few dishes from online recipes and a favorite curry book. I strictly followed the instructions, as I have no idea how to free myself of them to give this beautiful cuisine my own spin. A handicap I wish I could escape. Perhaps there’s an Indian cooking school somewhere I can attend. I’ll look into that when things slow down, but for now I’ll stick to the instructions. This dish is incredibly rich and flavorful with heavy cream and fragrant spices. For a vegetarian version, skip the chicken and add some diced paneer and a few handfuls of chopped fresh spinach into the sauce after it's reduced a bit. 3. Lightly oil the grill grate. Thread chicken onto skewers and discard marinade. Grill until juices run clear, about 5 minutes on each side. Set aside. 1. Melt butter in a large heavy skillet over medium heat. Sauté garlic and jalapeno for 1 minute. Season with 2 teaspoons cumin, paprika, and 3 teaspoons salt. Stir in tomato sauce and cream. Simmer on low heat until sauce thickens, about 20 minutes. 2. Add grilled chicken, and simmer for 10 minutes. Transfer to a serving platter, and garnish with fresh cilantro. This basic pilaf can be used with other recipes and cuisines. 1. Add the olive oil and butter together in a large nonstick skillet. Cook over medium high heat until butter is melted. Add the onion, salt and pepper and cook until softened. 2. Add the rice and cook stirring occasionally until some of the kernels start to turn golden. 3. Add the water and bring to a boil. Stir and reduce to a simmer, cover with a lid and cook until the liquid is absorbed, about 20 minutes. 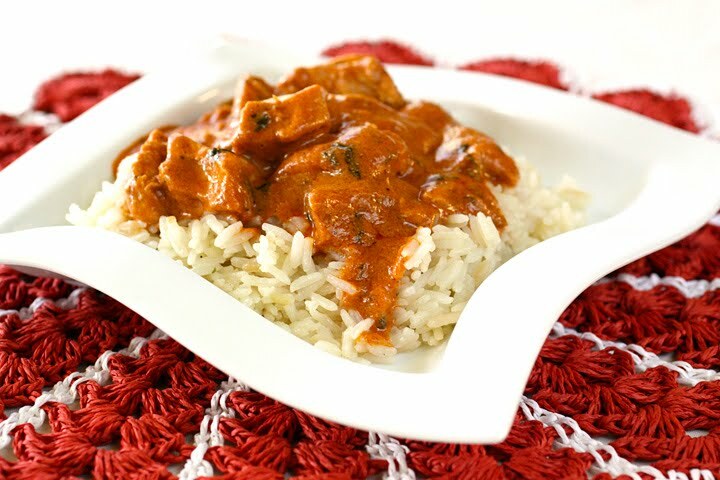 Chicken Tikka Masala from Allrecipes.com. Basic rice pilaf and picture by Laura Flowers. I feel the same way about Indian food! The flavor profile is so alien to me (although I love it!) that I wouldn't even know where to begin to adapt it! This looks fantastic though! Very nice Laura. It sounds really good. I like anything with cumin in it. This dish has a lot of good spices added. I know it tastes good. Laura, this is a cuisine I don't venture in very often but your dish looks incredible! I love everything about it. I'm bookmarking this to add to my menu! So I wish we had made this for our dinner guests on Friday night. Wow! This sounds like such a moist and flavorful chicken dish. Thank you for sharing it with us...I'm in the mood for Indian food now. I'm such a huge Indian food fan. Now I'm craving some! Oh, I love this dish but have yet to attempt it. This recipe is so simple, I now have no reason not to. I think to be able to put your own spin on recipes, you have to be pretty familiar with the type of cuisine, which I am not, so I do the same thing--follow the recipe. I usually change something in every recipe I make, but when it comes to Indian food, the cuisine most foreign to me, I just do everything the recipe says. Can't wait to follow this one! I'm a huge Indian food lover myself but Benny hates it so I only get to go maybe twice a year..:( BUMMER..lol, none of my local friends enjoy it either??? Lol ok that's funny! Maybe it's classic? I don't know about about Indian food, except that it's amazing and I want to be able to make all my favorite dishes. It looks very tasty. I like following recipes, and I've found that it has helped me learn a lot of new cuisines. At the moment I'm trying a bit of French and a bit of Vietnamese food, both things I prefer to try with guidance!